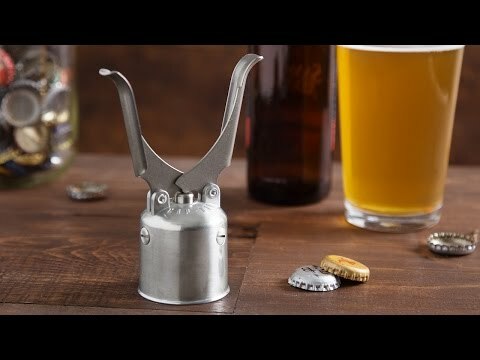 This sleek, American made mechanical bottle opener is modeled after one that was invented in the 1940s and it’s Made for a Lifetime. You’ll be opening bottles with a plunge and a pop instead of a pry for generations to come. Dimensions: 5.9" x 3.4" x 2.4"
Loved the old time feel and look! Works great! Everyone wants to try it! Will order more for gifts. looks old has a heavy feel to it and works great. So cool, loved it thank you so much! One of my favorite bar implements. Looks like an antique but works perfectly. Great conversation piece. 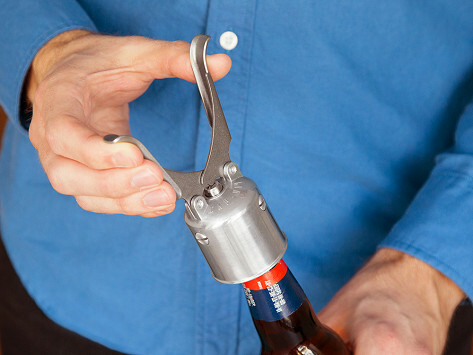 This mechanical bottle opener is making a comeback after decades. Pop your bottle caps off with a quick plunge like they did in the 1940s. It’s a retro design that’s Made in the USA and Made for a Lifetime. Maker Mike Grace was with his stepfather when he witnessed a vintage bottle opener in action. He was intrigued. Apparently the clever design had a limited production run by the now-retired Eagle Lock Company. Mike decided to buy the patent. There’s something instantly gratifying and also visually captivating about when this opener is it at work. Make sure you have extra bottles around for the occasion, because it’s the type of device everyone at the party will want to try out. Cap collectors love it because the cap comes off intact. This American made heirloom will be charming and hosting for generations.